As the various incarnation of the Doctors look to defeat the robotic Daleks in Time of the Daleks, they will be headed all across time and space, going on adventures, recruiting companions, and meeting different alien species (hostile and helpful alike). 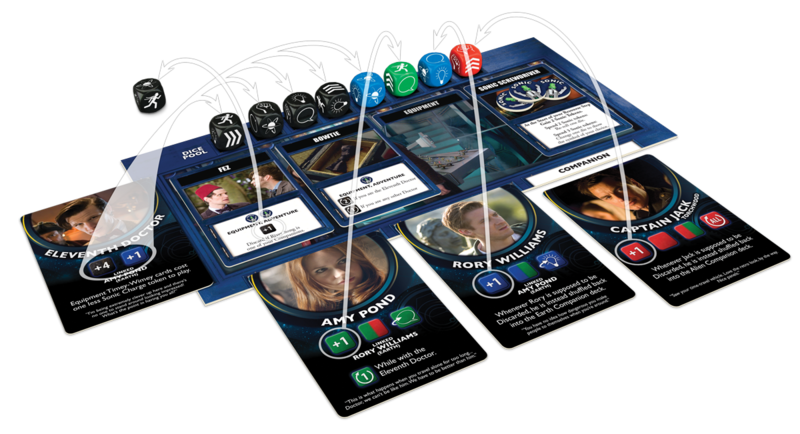 With all the timey-wimey stuff going on, you'll be rolling your different dice that you have in the game. In this preview, Gale Force Nine shows us a bit about how those dice work. There are six different dice symbols. Black dice have one of each of these symbols. The Green, Blue and Red dice are more focused than Black dice. Each has fewer symbols on them, but a better probability of getting those symbols, colour of dice you end up using, just as long as you roll the required symbols.